Plant, James C. et al. Chicago: American Technical Society, 1908. Original - not a reprint or e-book. Hardcover. Contents Good+ nice and clean. Covers have light shelf wear. All text blocks tight, but upper portions of feps on Vols. 3 and 4 have been cut at hinge, although bindings are still secure. Binding on Vol. 8 is split at page 122. Rubbing or some splittin to cloth at heads/tails of spines. Set is art school ex-lib. (non-circulating) with usual marks, including numbers on spines (in gilt).. All volumes: Maroon cloth/boards; gilt lettering and (5) bands on spines. Marbled page edges; color frontis. Pagination varies among volumes from 348 to 428 with bw line drawings, photographs, architectural plans throughout. Several tables of data included. Volume 10 missing. Heavy at 34 pounds (15.5 kilos) and will require extra postage. This set was prepared by a staff of architects, builders, and experts "of the highest professional standing," including 40 main authors and additional authorities consulted. 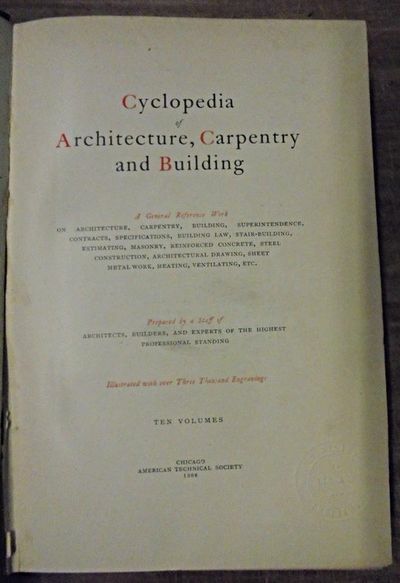 A general reference work on architecture, carpentry, building, superintendence, contracts, specifications, building law, stair-building, estimating, masonry, reinforced concrete, steel, construction, architectural drawing, sheet metal work, heating, ventilating, etc. All ten volumes include more than 3,000 engravings.